Oh boy last week was a long and stressful one here at Dandelion HQ but thankfully it ended on a lovely note. Last month my mum-in-law bought a Butterfly Garden for Bubs as she and I thought it would be wonderful for Bubs to be able to watch the life cycle of these amazing creatures. Our tiny little caterpillars arrived in the post (I never thought I’d be writing that sentence!) and we popped their cup on the mantlepiece so that we could check on them everyday. They grew and grew and grew until there was more caterpillar than cup but they showed no signs of wanting to form chrysalises. Then practically overnight we had five plump cocoons hanging from the top of the cup. Time to move them into the special butterfly habitat and await their transformation. And then Bubs fell ill and we sort of forgot about the cocoons until one morning my mum-in-law spotted that the habitat was now home to five beautiful painted lady butterflies. The idea of the habitat is that you put fruit and flowers in it for the butterflies to feast on and we had hoped that Bubs would be able to do this bit but she was just too poorly, so it fell to nana to keep them fed and nectared. Then came time to release them into the wild. We put this part off as long as we possibly could in hopes that Bubs would recover enough to watch. Thankfully on Sunday she was back to her happy self so we all trooped into the garden to wave bye-bye to the butterflies. And with that our five little butterflies flew off to start a life of flitting from flower to flower. 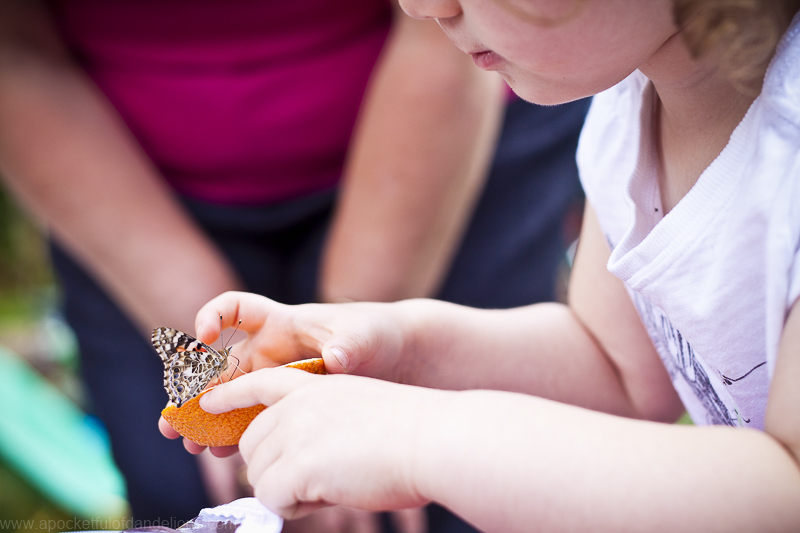 If you’re looking for an interesting nature activity for kids of all ages then I highly recommend trying a Butterfly Garden. We’re going to be ordering another batch of caterpillars in hopes that Bubs will be able to play a bigger part in the process next time. Ahh beautiful photos, Vickie. I’m glad Bubs was well enough to enjoy the releasing of the butterflies. Thanks Jenna! It was lovely to be able to included Bubs in their release as she’d have hated to miss it. Oh, I love this so much, Vickie! What a great activity and the photos (as always) are gorgeous! Fab photos Vickie. This is such a lovely thing to do with toddlers. I will have to look into it for Oliver, although I am a little squeamish when it comes to caterpillars, will have to get Daddy on the job!